Customer journey mapping continues to gain both traction and increased relevance as organizations around the globe orient towards a more customer-centric way of doing business. Though by no means a ‘silver bullet’ on the road to better customer experiences, Journey Maps remain an important tool to help companies better understand what’s happening today, and what customers want tomorrow. In an ‘outside-in, customer-centric’ way, they serve to codify and share relevant information across an org in easy-to-understand and compelling ways, and help to identify and prioritize specific initiatives that can lead to the design and delivery of the experiences your customers. These are all good reasons to invest in customer journey mapping. But best-in-Class CX leaders are far more likely than all others to leverage journey maps have an even more compelling incentive: those that do journey maps right drive top- and bottom-line value in measurable, significant ways. They enjoy the truly eye-popping ROI Benefits of customer journey mapping, including things like 200 percent greater employee engagement, 350 percent more revenue from customer referrals, and more. 54% Greater Return on Marketing Investment: Interested in boosting the effectiveness of your marketing spend – reaching more of the right customers, more quickly? Here’s an answer. (24.9% YoY growth with Customer Journey Management, 16.2% without). 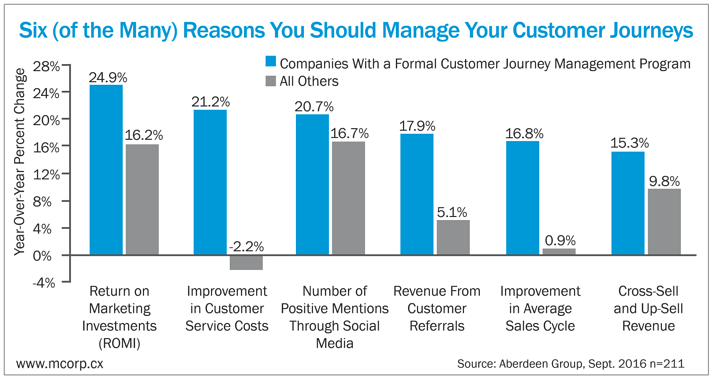 Over 10 Times Improvement in the Cost of Customer Service: Of the major areas customer experience drives ROI, reduction in costs (in addition to new business from positive word of mouth, greater wallet share and lower churn) are among the easiest to sell internally. (21.2% YoY growth with Customer Journey Management, -2.2% without). 24% More Positive Social Media Mentions: One way to boost word of mouth and social influence - among the most powerful drivers of engagement in the era of smart customers. (20.7% YoY growth with Customer Journey Management, 16.7% without). 3.5 Times Greater Revenue from Customer Referrals: Linking to social media mentions, but even more powerfully to analog conversations, referral customers are some of the least expensive to acquire. (17.9% YoY growth with Customer Journey Management, 5.1% without). 18 Times Faster Average Sales Cycle: What if you could radically accelerate the speed of your sales cycle? Good news: you can! (16.8% YoY growth with Customer Journey Management, 0.9% without). 56% More Cross- and Up-Sell Revenue: With a direct linkage to greater share of wallet and customer lifetime value, increased top- and bottom line revenue follow closely behind. (15.3% YoY growth with Customer Journey Management, 9.8% without). Given the value customer journey management can drive, it’s clear that this is a huge opportunity for any company. Yet today, less than 40 percent of companies have a process to better map their customer journeys. And of those that do, few enjoy the kinds of benefits I’ve discussed above. While the reasons for lack of traction and measurable results are myriad, we most often see that journey maps become good-looking artifacts that inform, but don’t help drive real change. In other words, just having them isn’t enough. No matter how good looking or comprehensive your journey maps are, they need to be “operationalized” in ways that make your customers lives better, and your operations more efficient and more profitable. If they don’t drive to action, they might be interesting… but ultimately useless.